A year ago, low-cost carrier Spirit Airlines made its debut in the American Customer Satisfaction Index with a thud, coming in dead last among airlines in the annual survey. But even with a 15% improvement over last year’s score, Spirit still couldn’t escape the cellar. 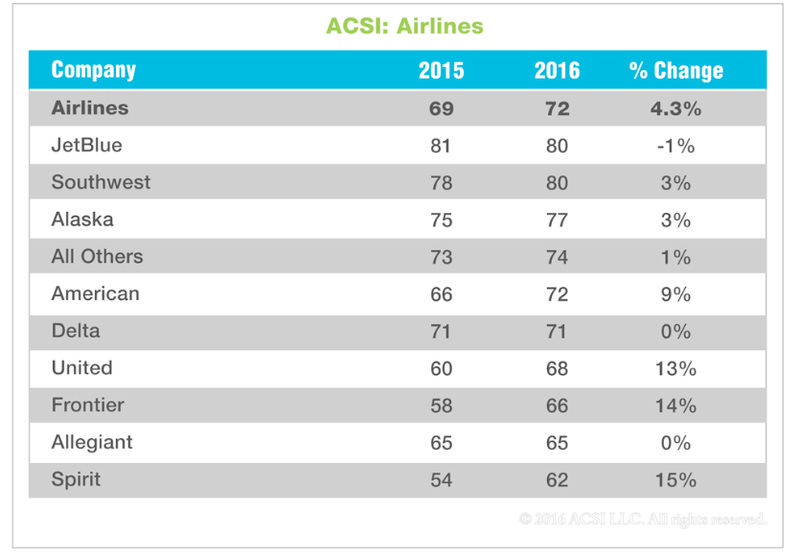 While the airline industry has historically been among the worst of the dozens of sectors scored by the ACSI survey [PDF], the past two years have shown overall improvement of scores for nearly all carriers. The average score for airlines has improved one percentage point from 2015 to a 72 out of a possible 100, matching the industry’s peak from 1994. While JetBlue continues to top the ACSI rating list, it’s only because “J” comes before “S.” After years of lagging behind JetBlue by less than five points, Southwest Airlines finally caught up to its competition, tying for the top spot. Both airlines recorded a score of 80 — that’s a one point decrease for JetBlue and a two point increase for Southwest. ACSI suggests JetBlue’s slight shift in customer satisfaction is likely a result of the company’s decision to start charging for checked bags. On the other hand, the report insinuates that Southwest’s jump in satisfaction is a result of finally ironing out its issues with the years-old merger of AirTran and subsequent expansion into international travel. Alaska Airlines, in its second year on the list, grabbed the second place spot with a score of 77, two points above its debut score of 75 in 2015. American Airlines jumped 9% from it’s score of 66 in 2015 to match the 2016 industry average of 72 points. “Remarkably, American seems to have avoided major snafus with integrating US Airways operations after their merger,” the ACSI report states. While the two remaining legacy carriers — Delta Air Lines and United Airlines — failed to break the industry average, they also didn’t dip in scores. Delta remained steady at 71 points — its third year in a row at that score, while United saw a significant 13% increase to a score of 68. ASCI points out that increases for United and American may have something to do with the carriers reinstating free snacks in economy class and increasing access to in-flight entertainment options. Ultra-low-budget carriers Frontier, Allegiant, and Spirit round out the rest of the ACSI list, respectively. Frontier saw the second largest jump in score year-over-year with a 14% increase to 66 points. Allegiant, which faced the spotlight over repair issues, onboard fires, and safety concerns from those who fly the airline’s planes, remains unchanged from 2015 with a score of 65. And, as mentioned above, Spirit Airlines, which saw the largest increase at 15%, continued to bring up the rear of the ACSI ratings with a score of 62. Once again, seat comfort (or lack thereof) scored lowest among the various aspects of flying, scoring only 67 points — a three point improvement from last year. Gains last year for the airlines’ quality of in-flight services continued this year, increasing by three points to 71. 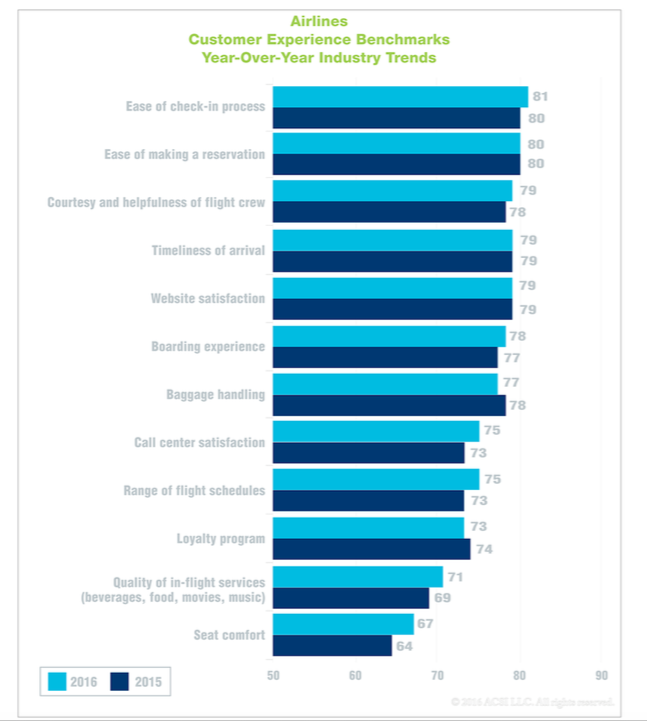 For many airlines, business travelers make up the most frequent and reliable customer segment. Overall, business travelers (76) report much higher satisfaction — 76 points than leisure travelers, who score satisfaction at 72. Still, more satisfaction doesn’t mean better results for airlines. Business travelers were found to be twice as likely to complaint compared to leisure travelers. In addition to rating airline satisfaction, ACSI released ranking for the online travel booking and hotel industries. For online booking, the overall average once again increased 1.3% to 79, the highest score the industry has achieved and places it at the top of the travel segment. Priceline is the highest-scoring company, up 8% to 81. Under the Expedia umbrella, Travelocity’s score is up 4% to 78, while Orbitz climbs 3% to 77, tying Expedia’s namesake brand. “The lack of differentiation among Internet travel companies means the real competition is with the websites of hotels and airlines,” Claes Fornell, ACSI founder and Chairman, said in a statement. 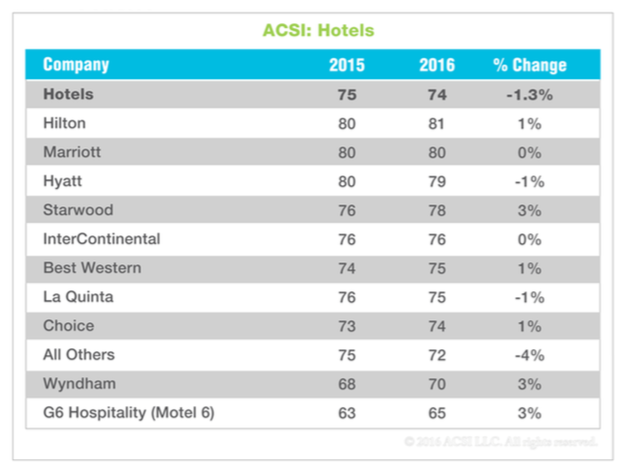 As for those hotels, there’s certainly room for improvement, according to ACSI, noting that overall satisfaction drove 1.3% to 74. Hilton moved up 1% to 81 and first place, while Marriott held steady at 80 and Hyatt fell 1% to 79. Starwood, which recently accepted Marriott’s merger bid after a bit of back-and forth with a Chinese consortium, rose 3% to 78. Midscale and economy hotels rounded out the bottom of the hotel lists: Best Wester and La Quinta tied at 75, and G6 Hospitality — along with its flagship brand Model 6 — garnered a last-place score of 65. Next Should Airbnb Be Forced To Make Sure Hosts Comply With Local Laws? Next Up: Should Airbnb Be Forced To Make Sure Hosts Comply With Local Laws?